An advertisement is seen here for Snow White Halloween "False Faces" in the April 1938 Playthings toy trade journal. 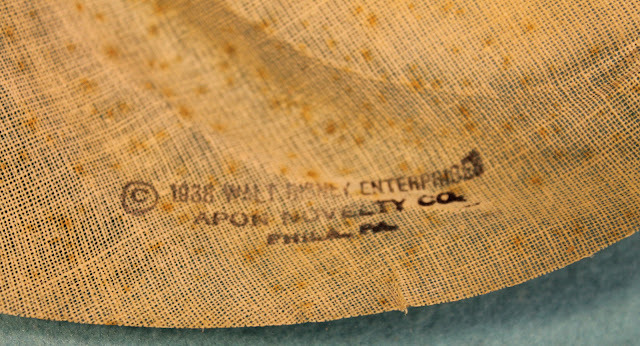 Manufactured by the Apon Novelty Company of Philadelphia, these masks were made from molded pressed-gauze material. 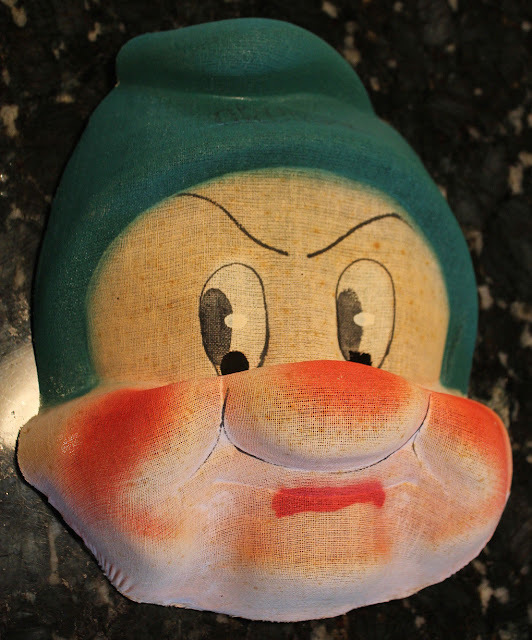 Original retail price only 25¢ and 50¢ each. A rare find, a Grumpy mask in nice condition. 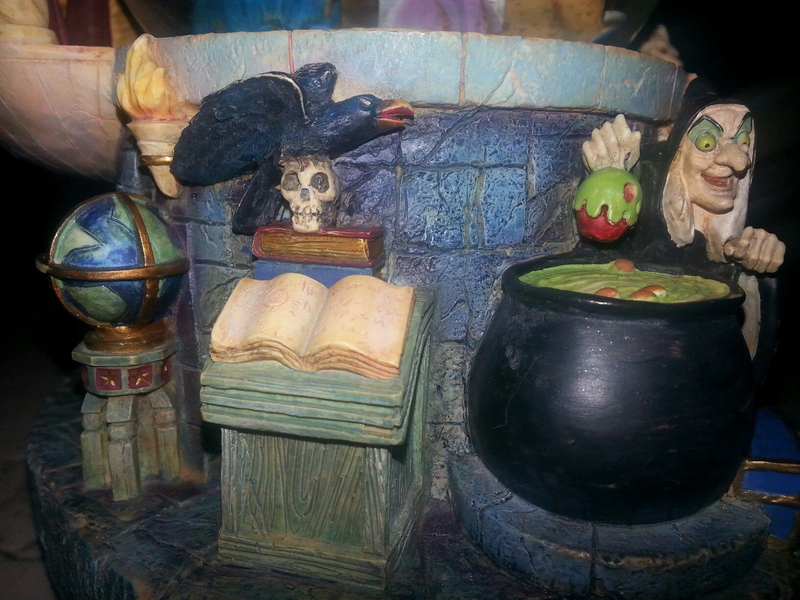 Measures 9" high x 8" wide. 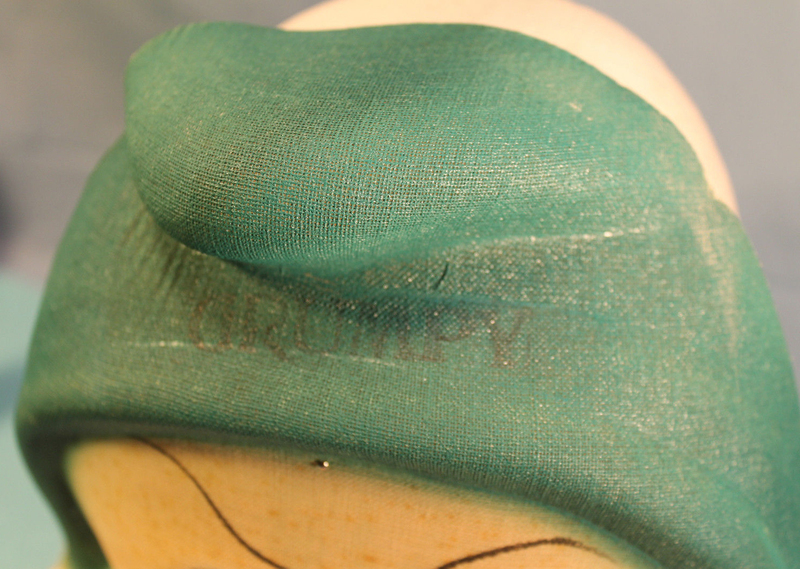 His name is printed across the front of the hat. 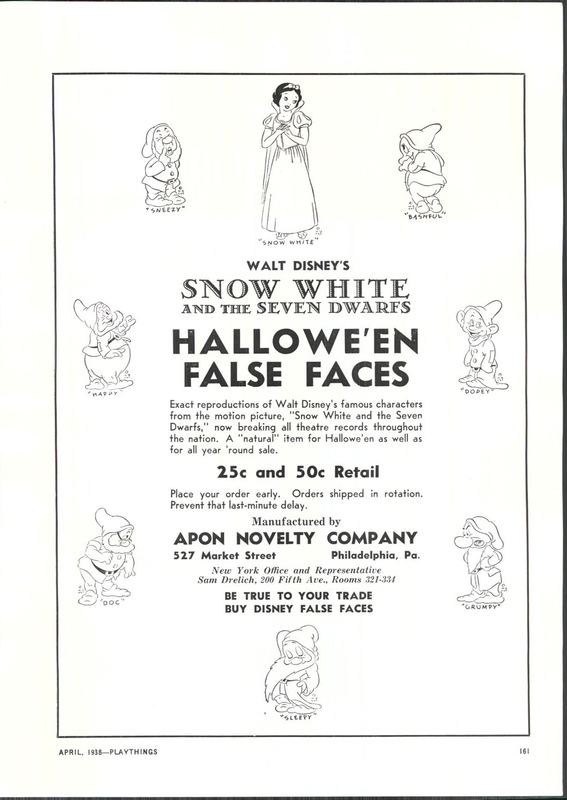 Imprint reads, "© 1938 Walt Disney Enterprises, Apon Novelty Co., Phila. 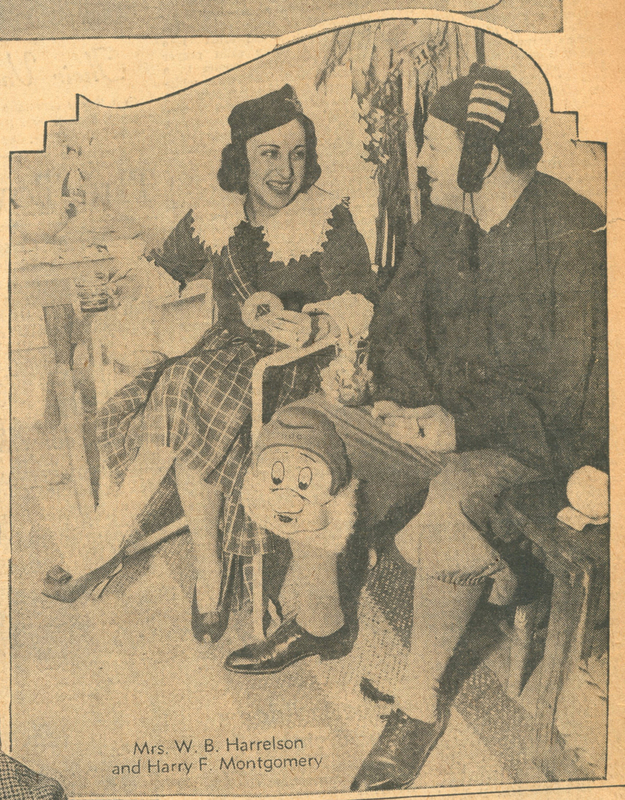 PA."
A 1939 clipping from the Kansas City Journal highlights a local Halloween masquerade party and a couple of its party-goers. 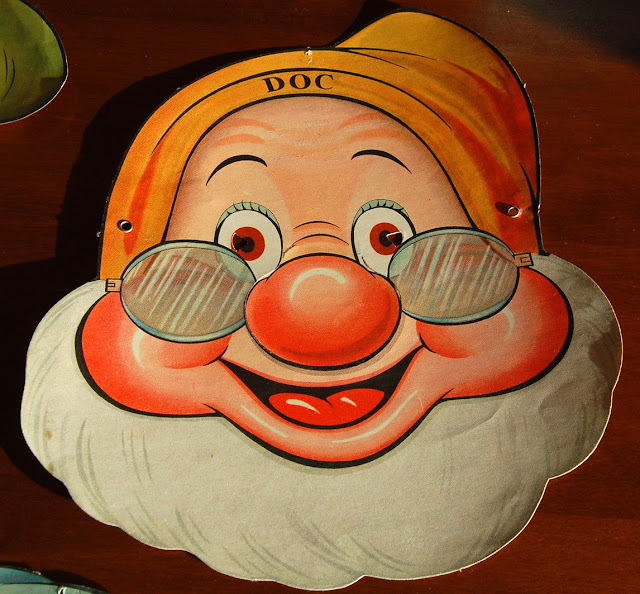 Featured in the photo is a Doc mask. 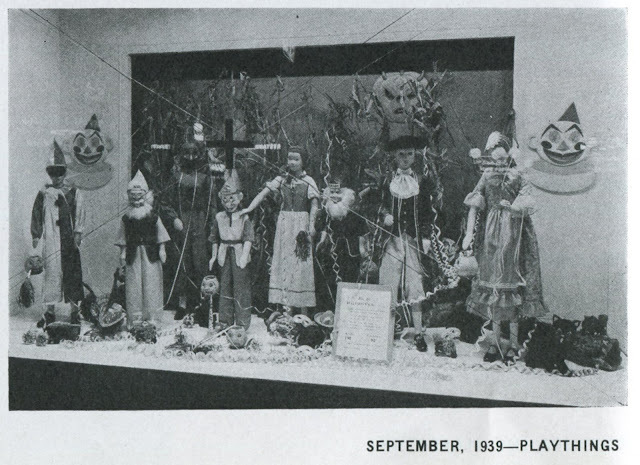 Happy and Dopey are shown in a Halloween store display published in the September 1939 Playthings. 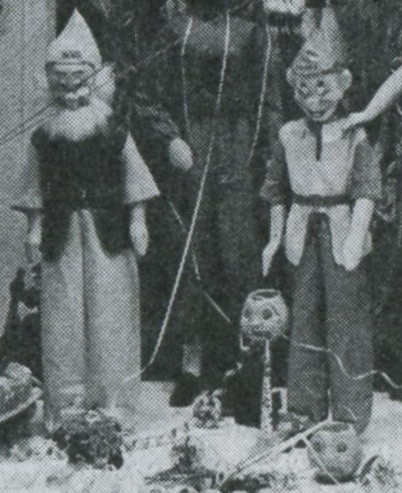 Images courtesy of the William Stillman Collection. 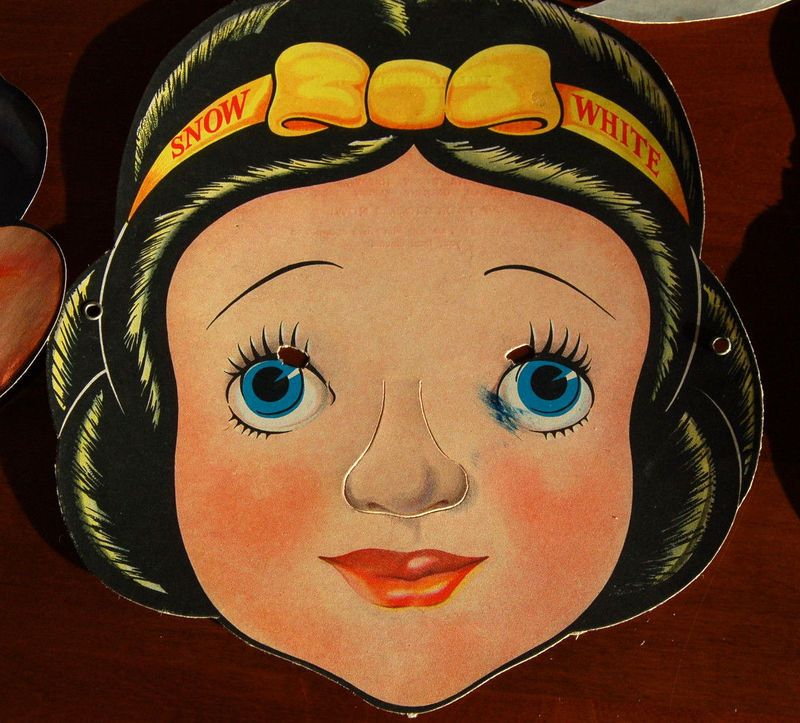 In an earlier Archive entry, we saw the 1937 Snow White paperboard "Par-T-Masks" that were produced by Einson-Freeman Company of Long Island City, New York. 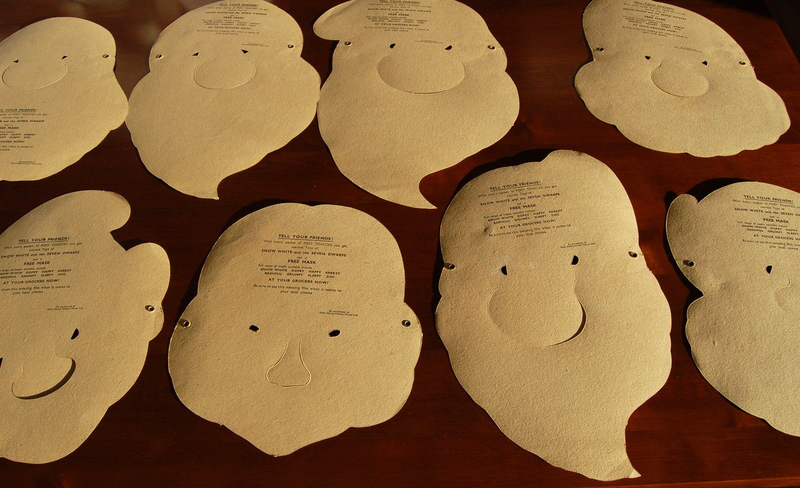 They were used as contest prizes and give-aways in various promotional campaigns. 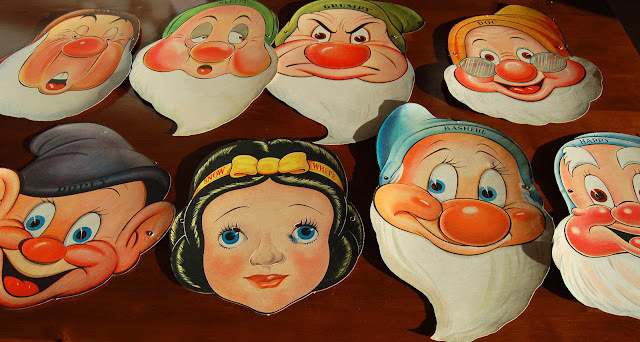 That series appears to only have included Snow White, Dopey, Grumpy, Doc, and the Witch. 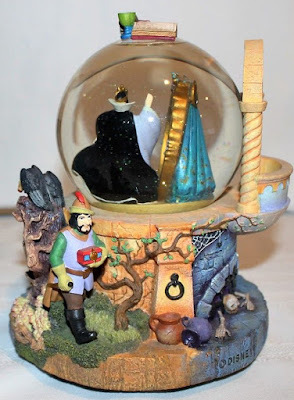 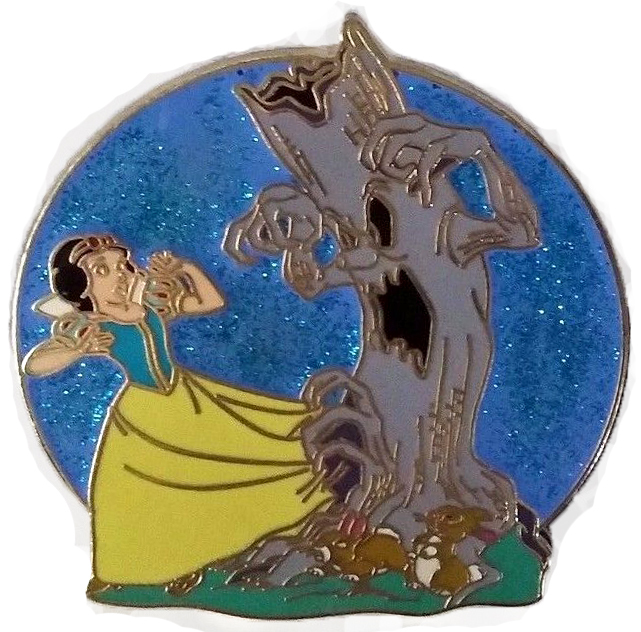 However, we see below that another Snow White set was also produced, this one for the Post Toasties breakfast cereal campaign. And it included all of the dwarfs. 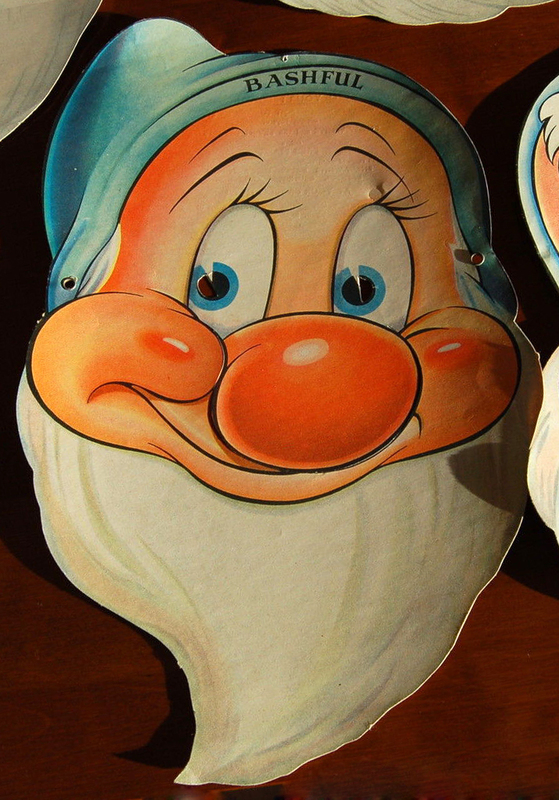 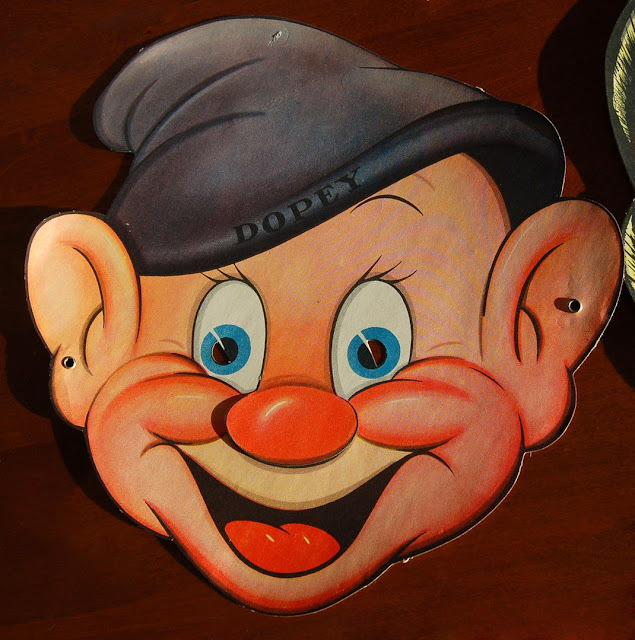 Dopey, Grumpy, and Doc are identical to the above-mentioned Par-T-Masks, but Snow White now wears a yellow bow and blue eyes (rather than brown). 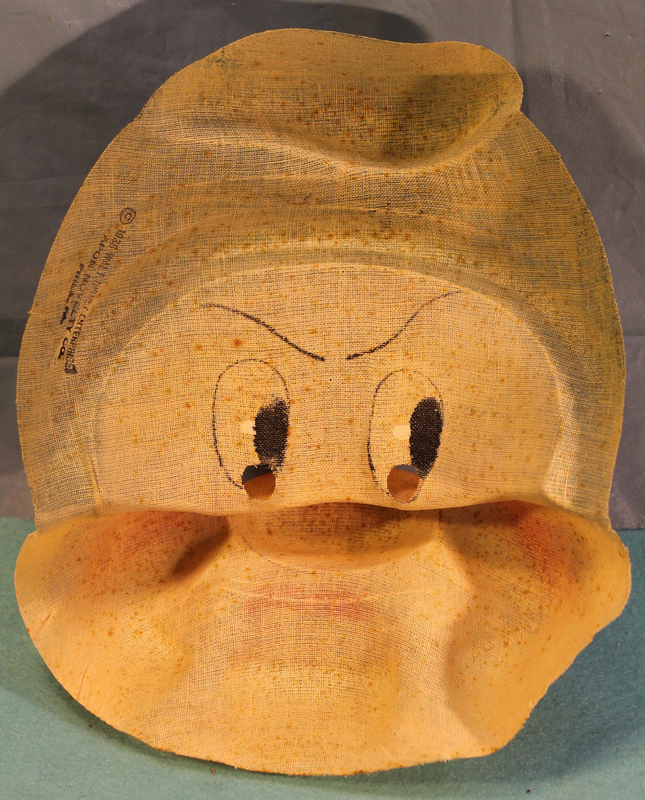 The masks in this series all have grommet holes; the earlier ones did not. 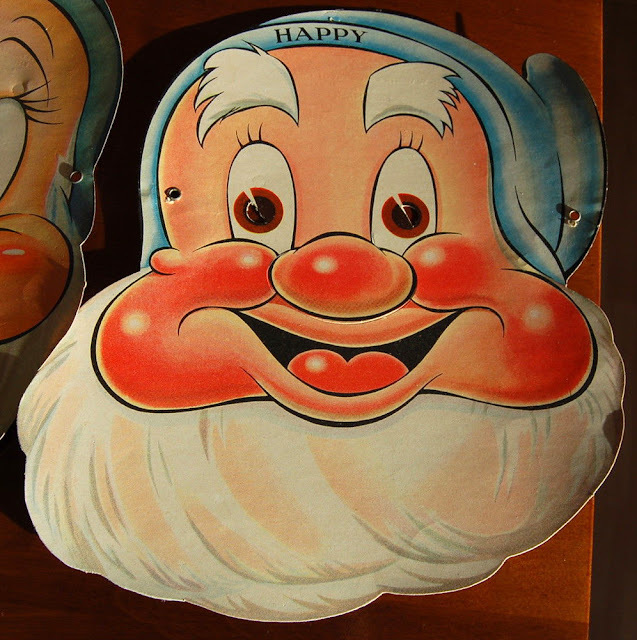 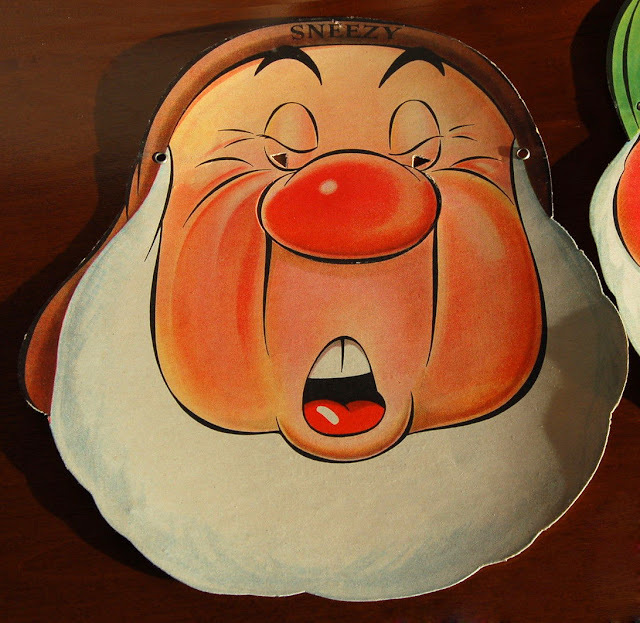 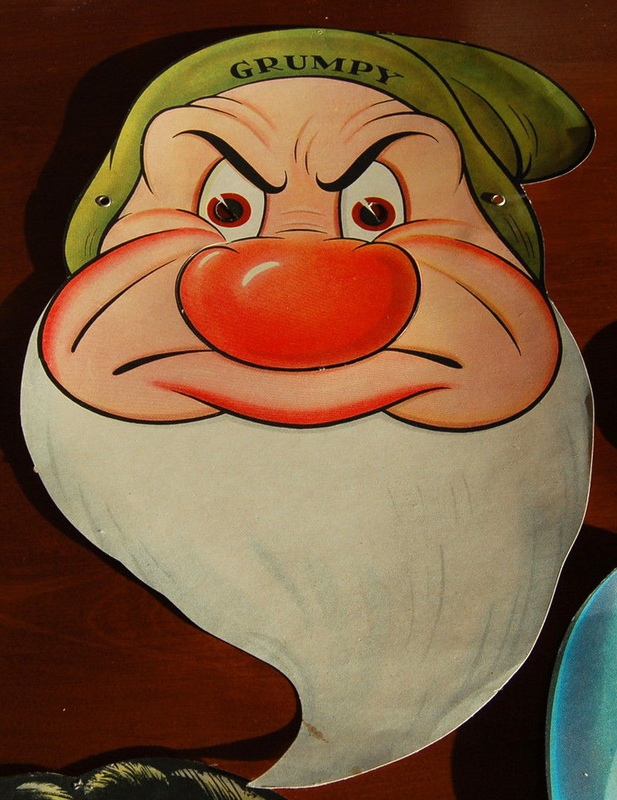 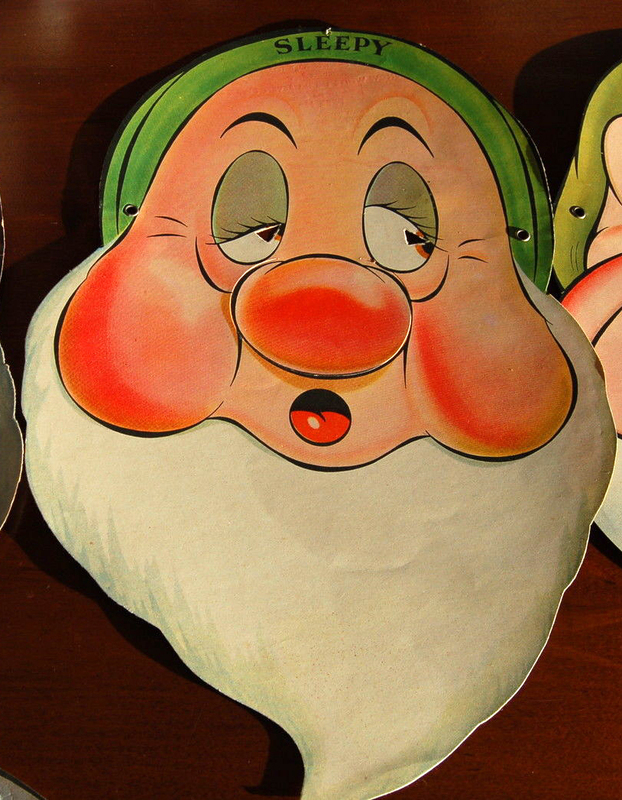 Dopey, Grumpy, and Doc are the same designs found in the Par-T-Mask set. Bashful, Happy, Sneezy, and Sleepy are included with this Post Toasties series. 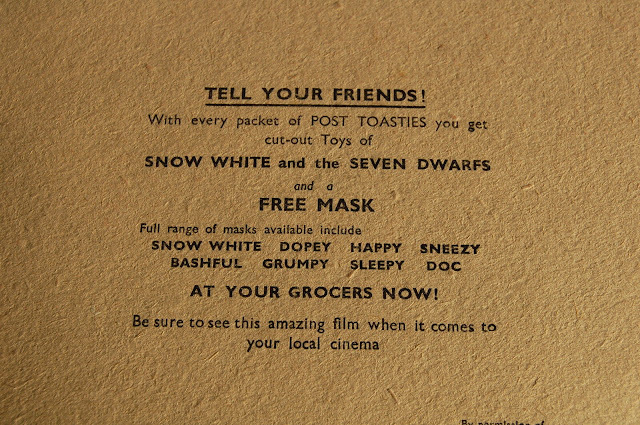 Post Toasties promotional info is found on the back of each mask. 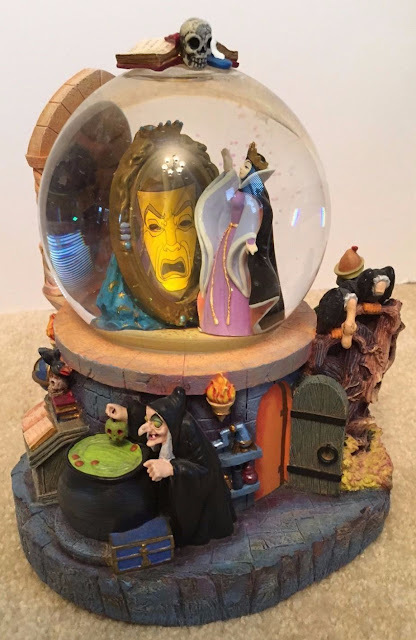 The Witch is not mentioned. Special thanks to Dant Melys for letting us know about this one. 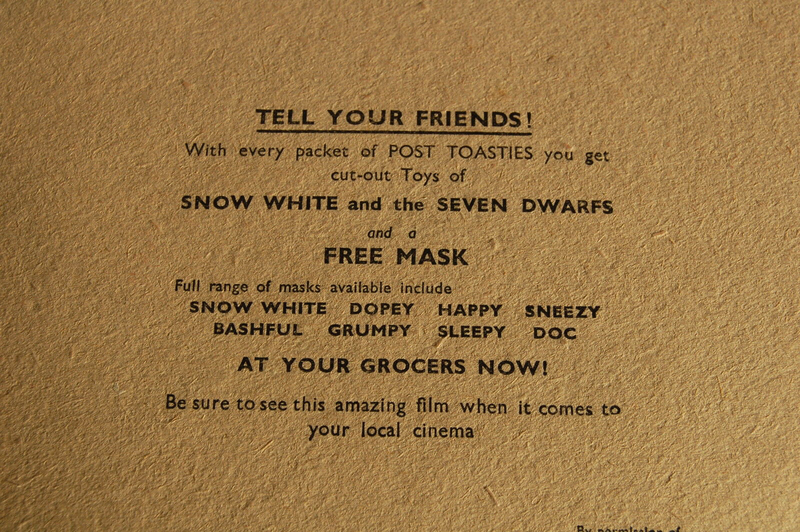 Also see an uncut Snow White Post Toasties box in an earlier Archive entry. Snow White's fears come to life in the Haunted Forest. 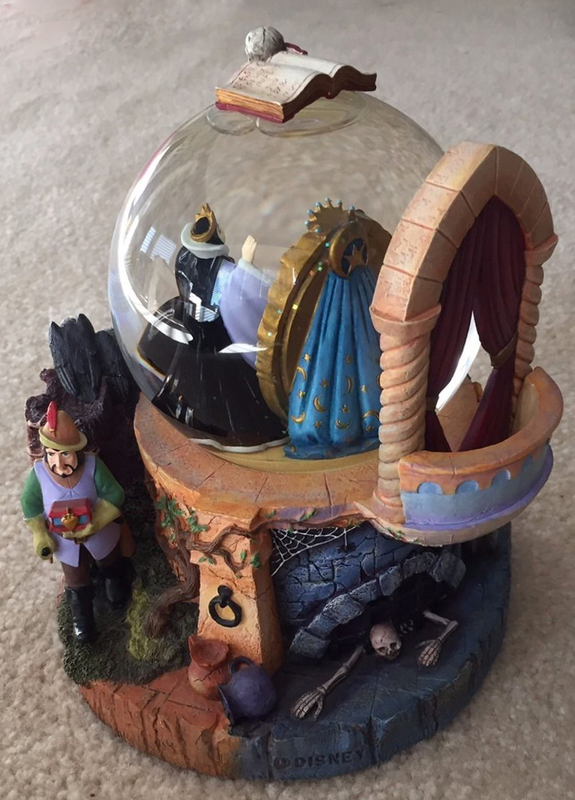 A side-mounted wind-up key plays Firebird by Stravinsky and activates the princess as she swivels back and forth. 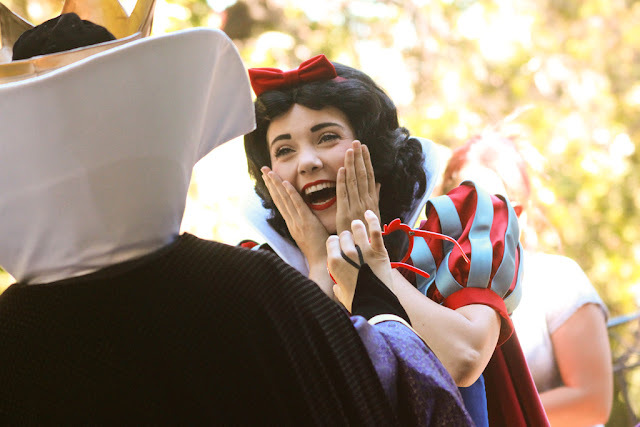 Battery-powered eyes light up on the trees and a blower swirls glitter around her. 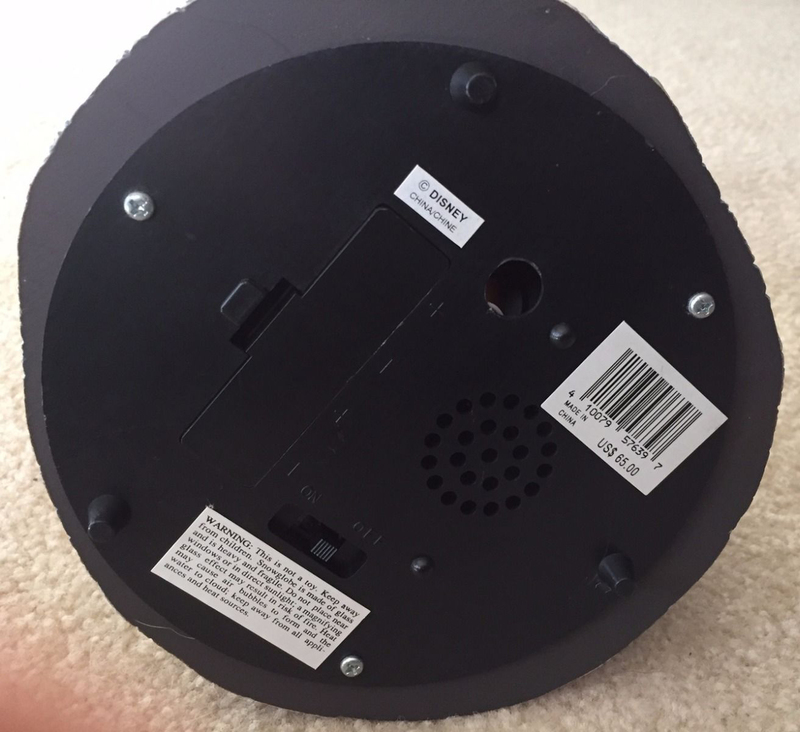 On/off switch is located on bottom. Resin and glass. 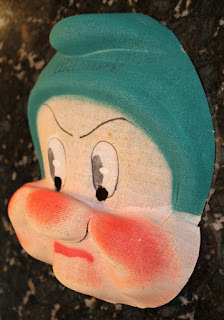 Measures 9” tall x 11” across. 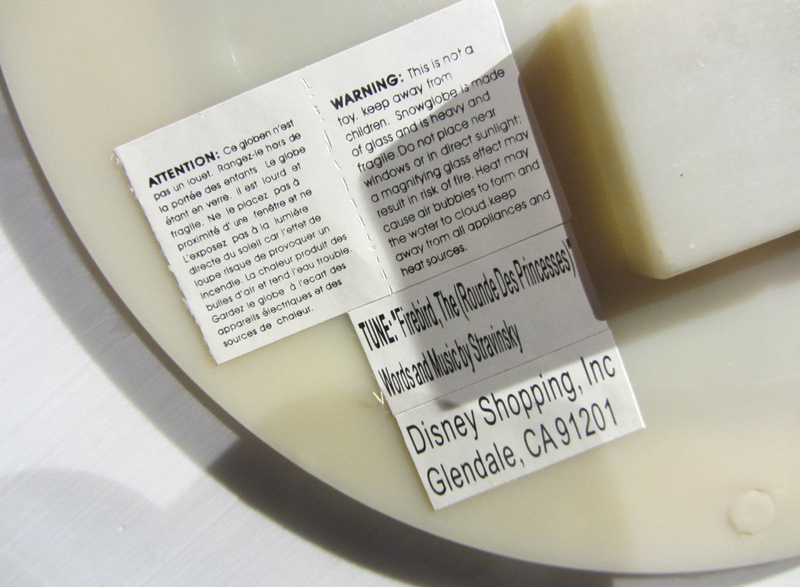 A DisneyShopping.com exclusive in 2006. 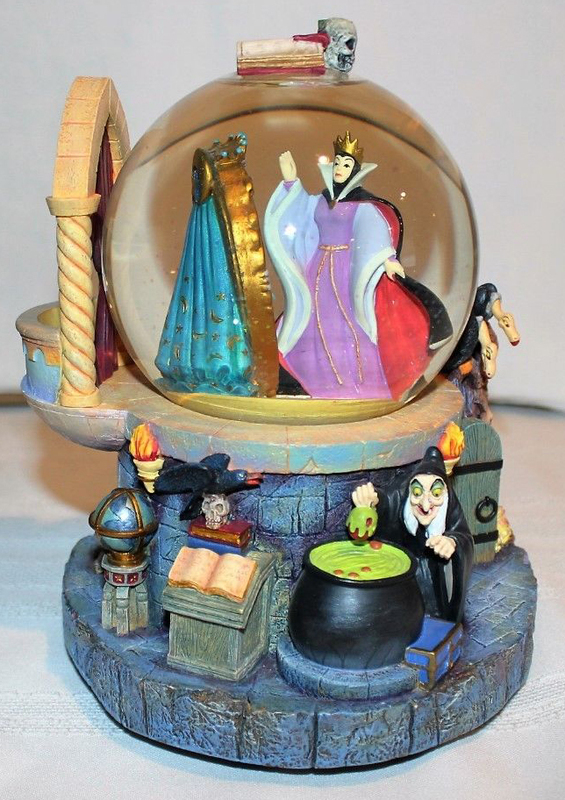 Original retail $79.95. 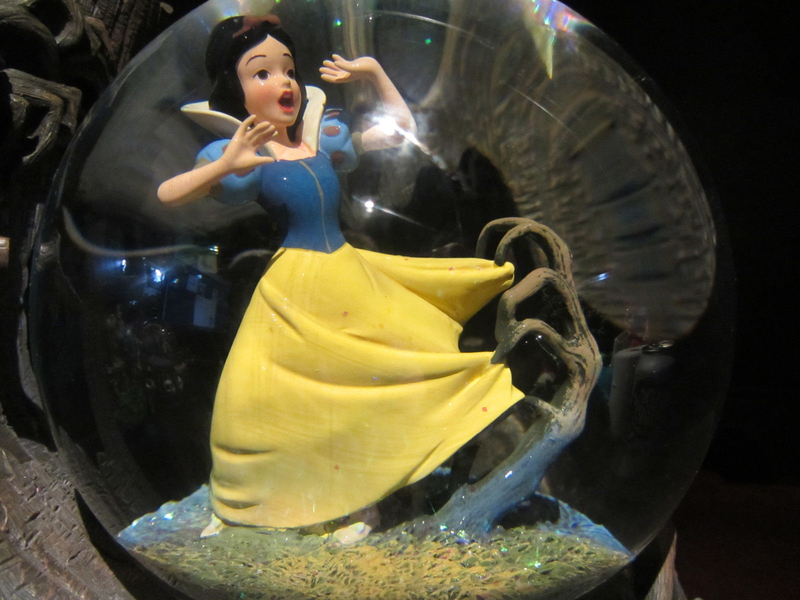 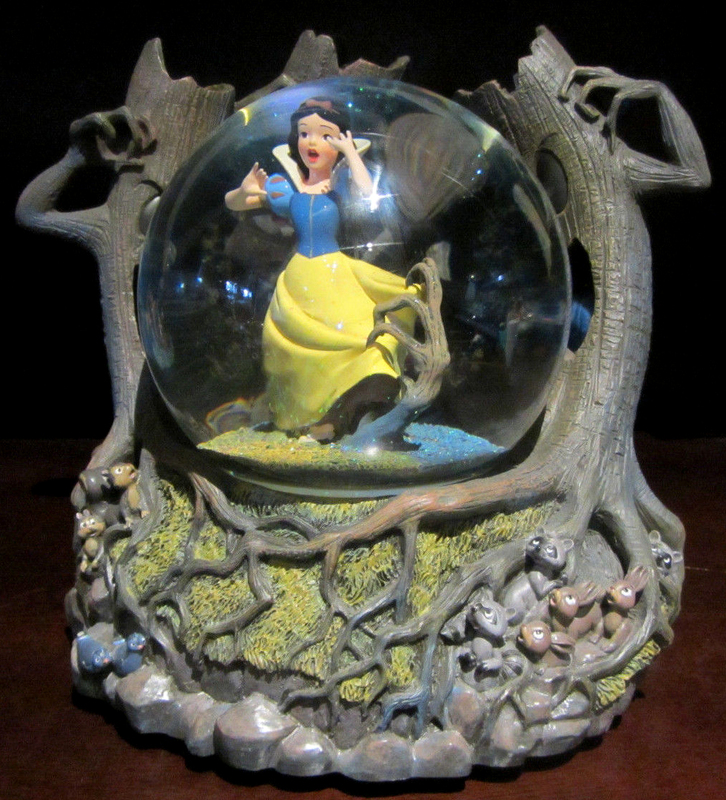 Additional info courtesy of Disney Snowglobes Collectors Guide. 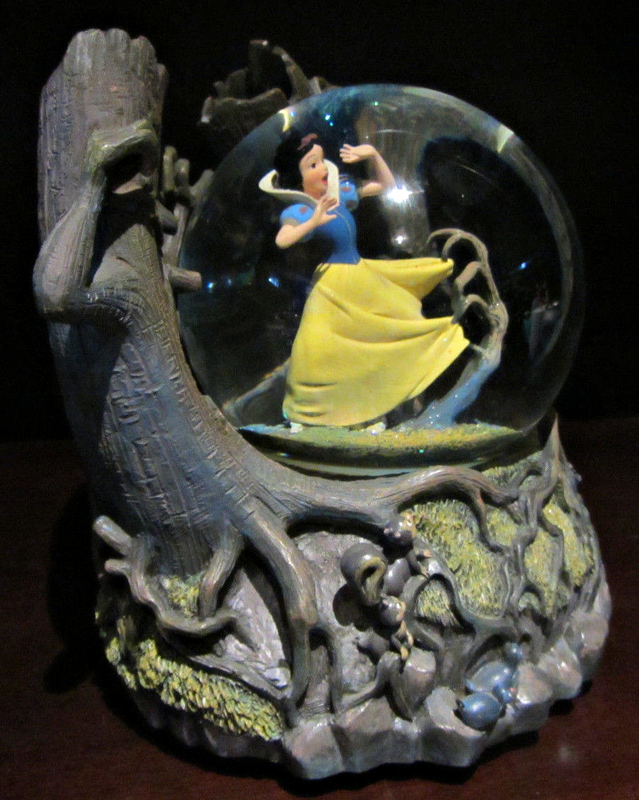 The first 500 guests to purchase the snowglobe also received a matching limited edition collectible pin. 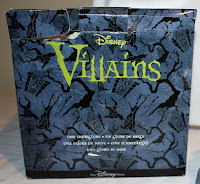 Counterfeits have been spotted. 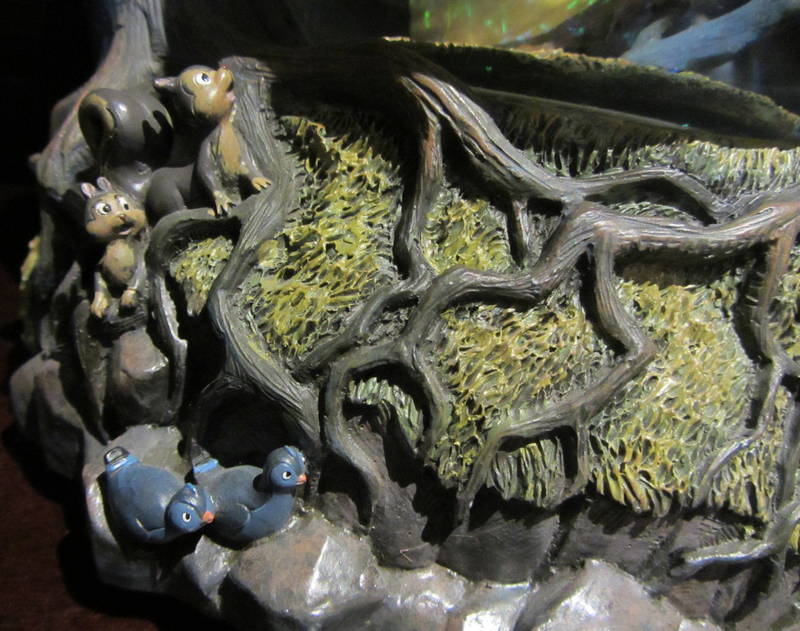 Only the original has the backstamp, "LE 500" plus the normal "© Disney - China." 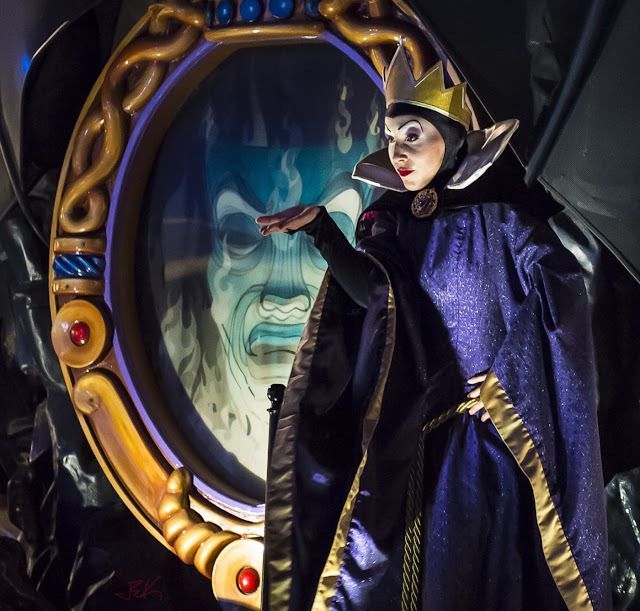 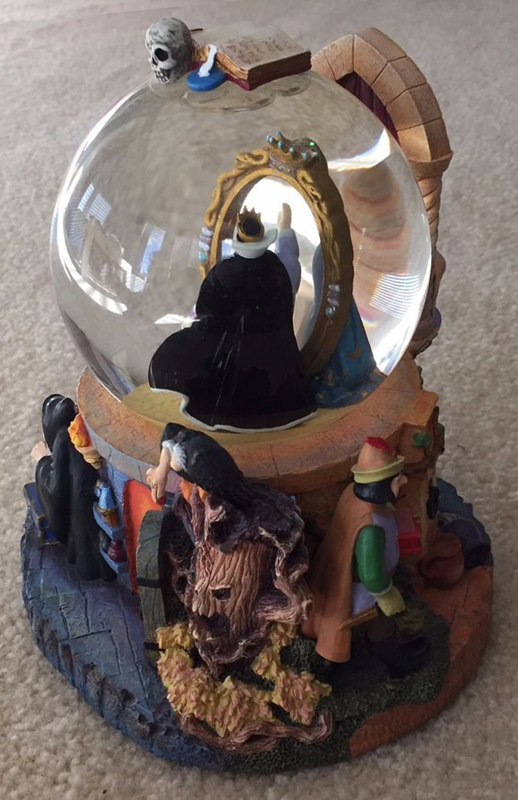 The Queen consults the Magic Mirror inside the globe while the Witch, Huntsman, and dungeon skeleton inhabit the space around the base. 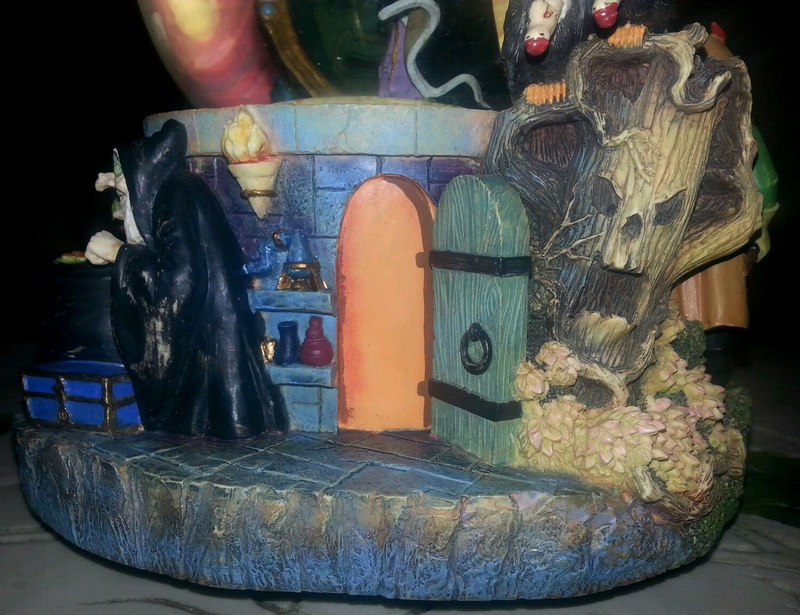 The spellbook and skull are perched on top. 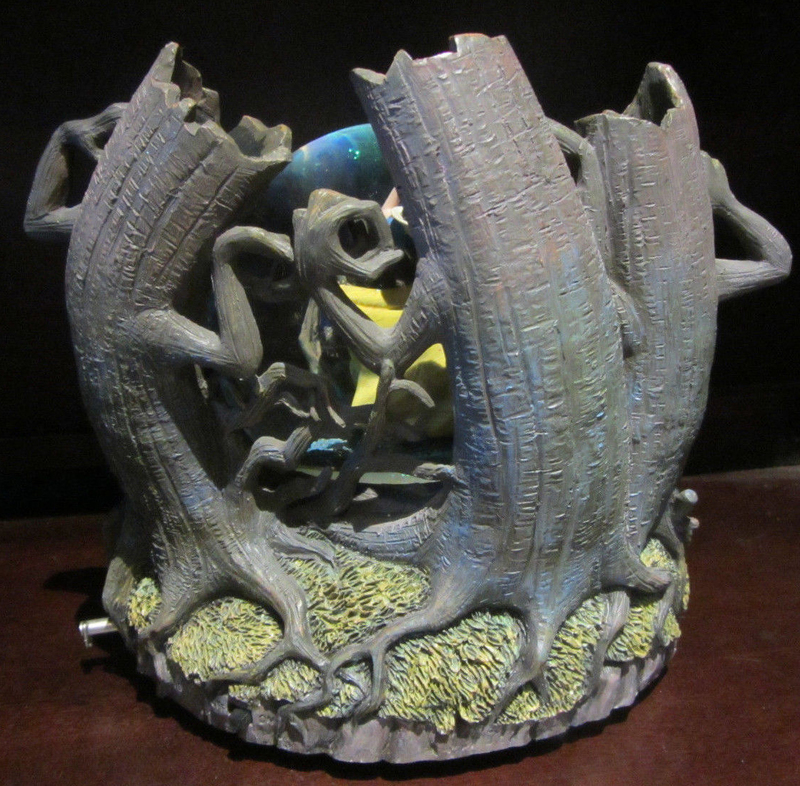 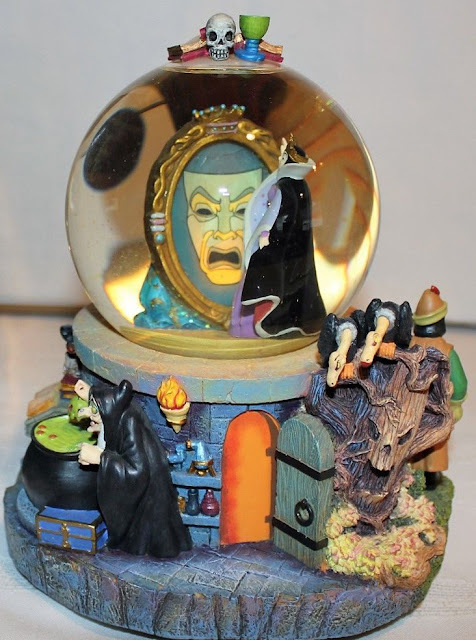 A bottom-mounted on/off switch controls the light-up mirror and plays a full 40 seconds of original dialogue from the scene in the film where the Queen transforms into the Witch. Battery powered. 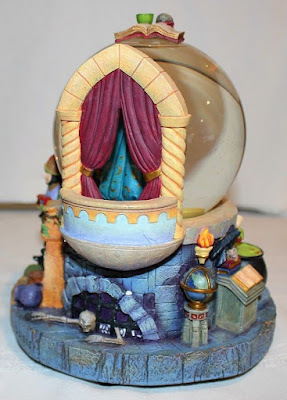 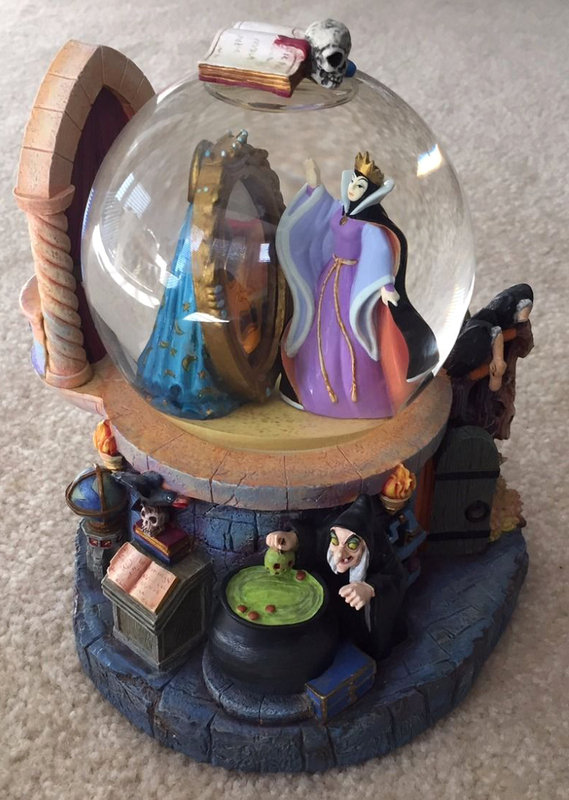 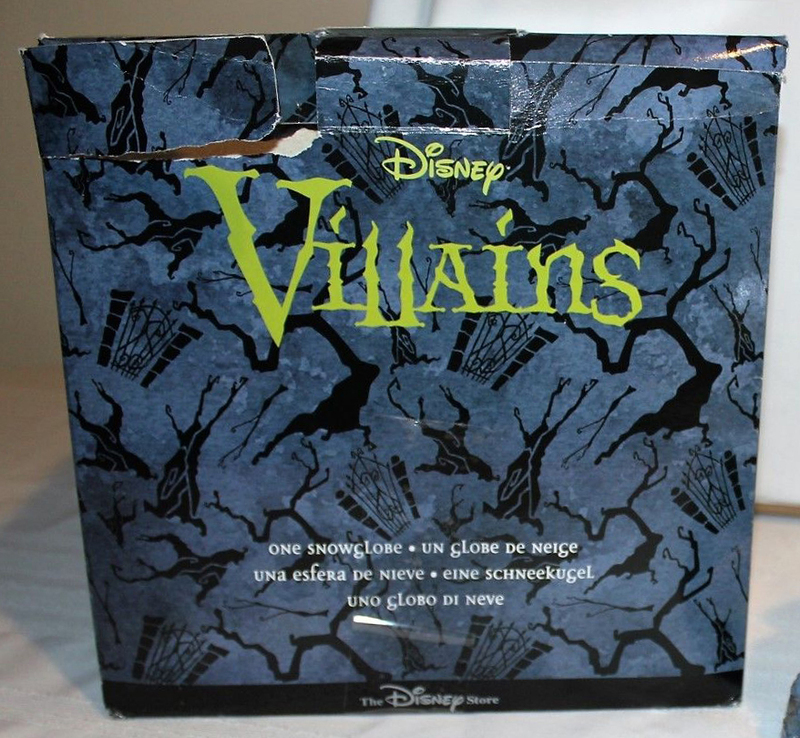 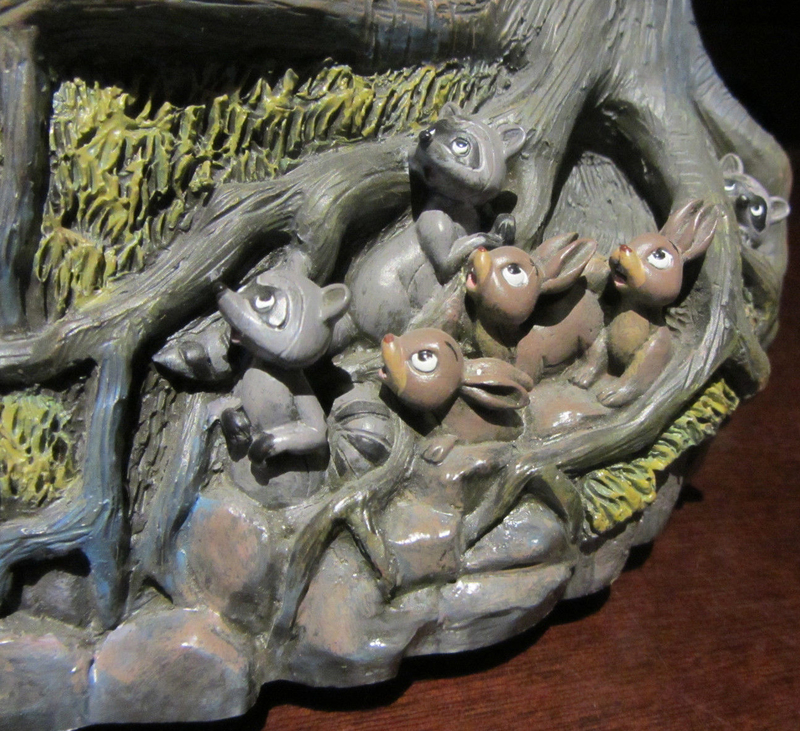 Originally sold in 2000 via the Disney Catalog for $65. Re-released online in 2008 for $79.50. 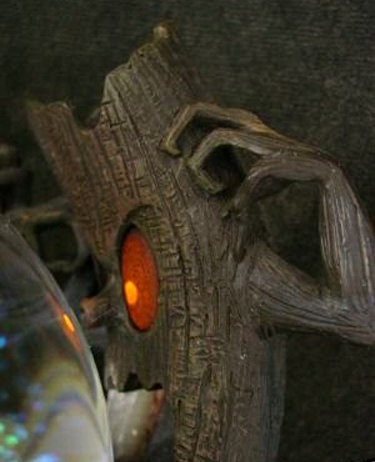 2010 September. 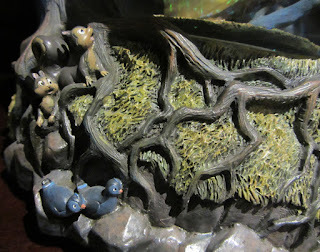 Disneyland Paris - Studios Park. 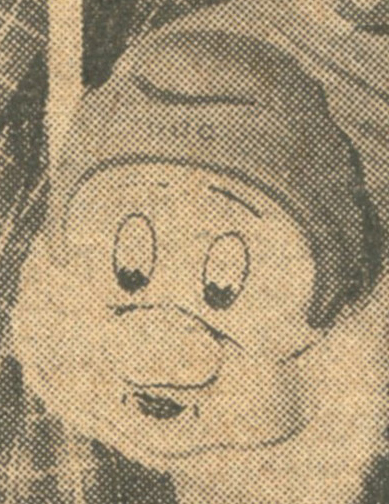 2011 September. 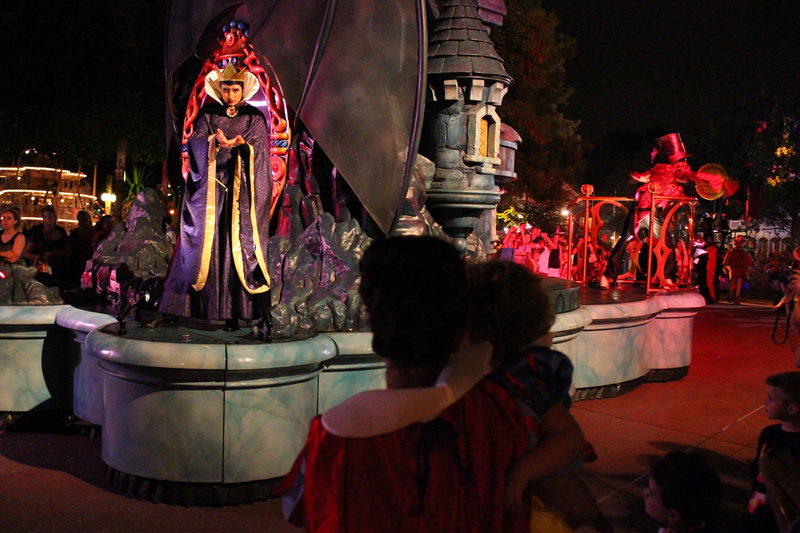 Walt Disney World (Boo to You Parade). 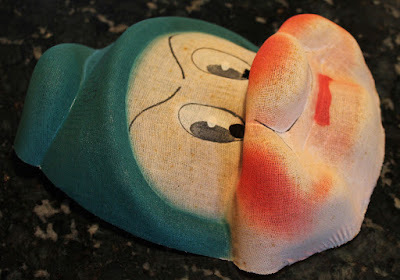 2013 May. 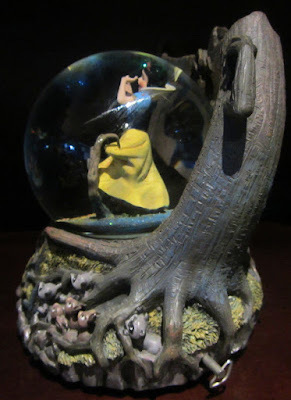 Tokyo Disneyland (One Man's Dream II). 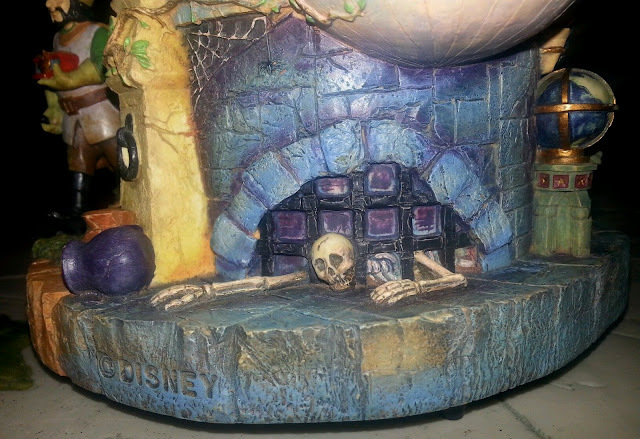 2014 October. Walt Disney World (Mickey’s Not So Scary Halloween Party). 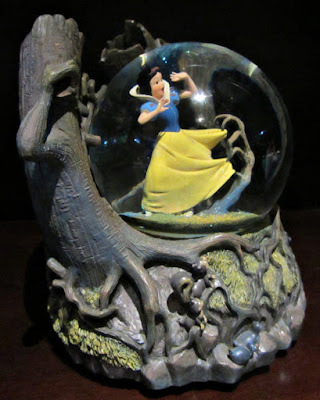 Photo copyright Joanie Eddis-Koch via Daily Disney Photo. 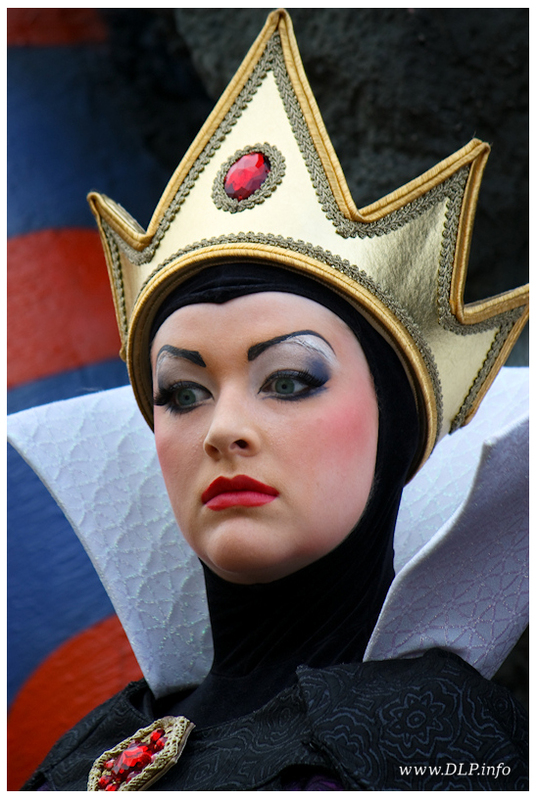 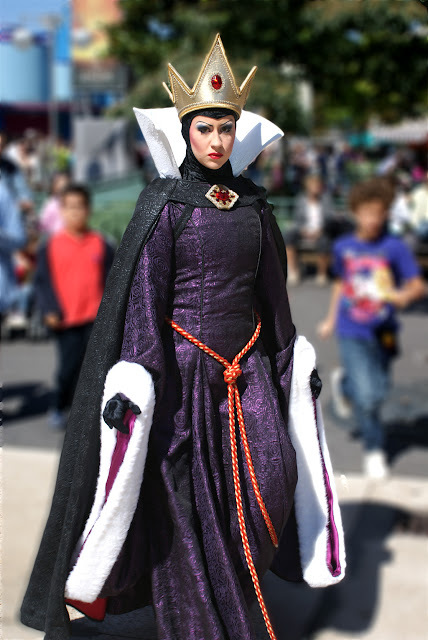 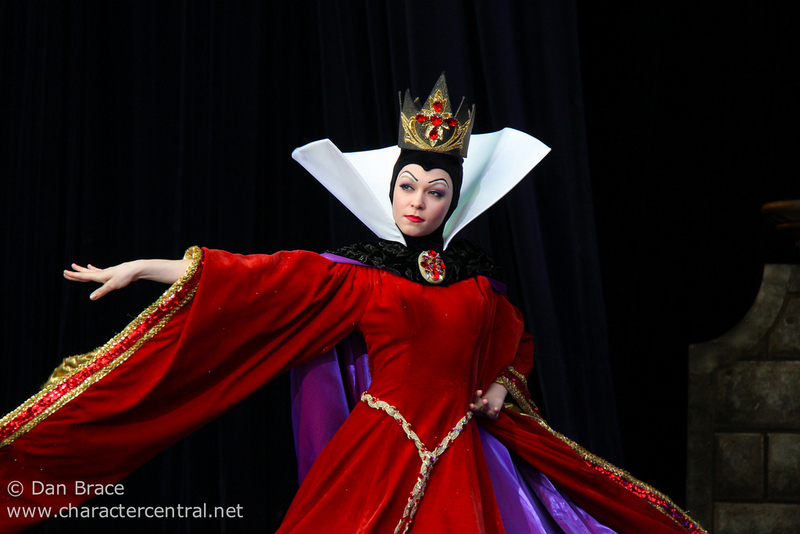 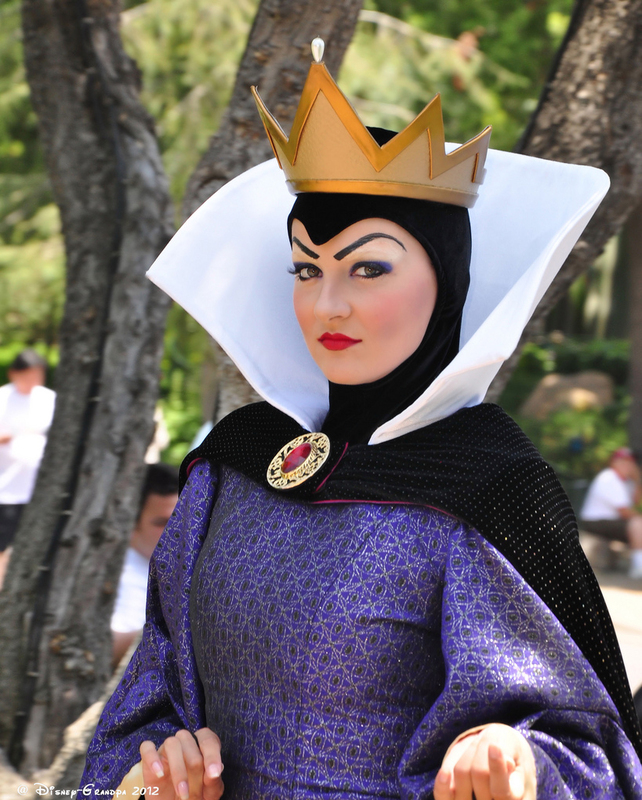 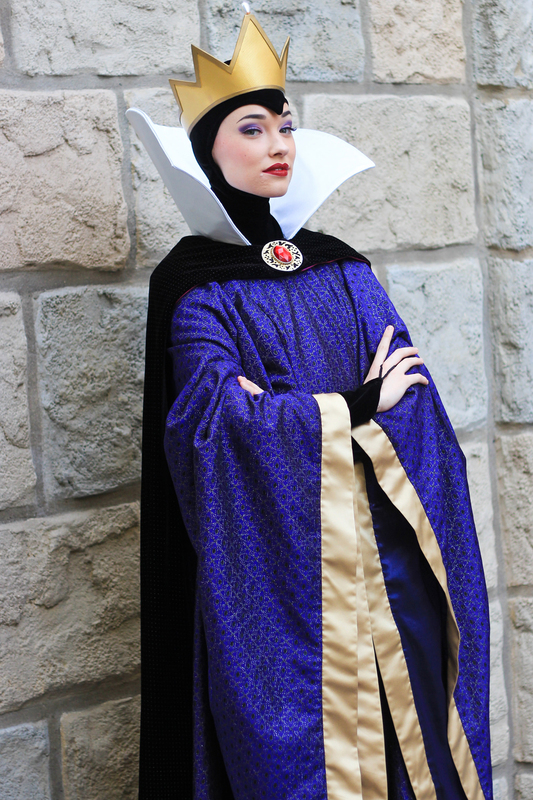 For more Evil Queen cast member images, be sure to visit professional photographer Britt Dietz's Evil Queen page.